I was up town visiting the Red5 gadget shop today (who'd have thought it) when I noticed they had robot kit at substantially less than half price. Of course I bought it. And I've already got plans for spending the money that I saved. Go me. 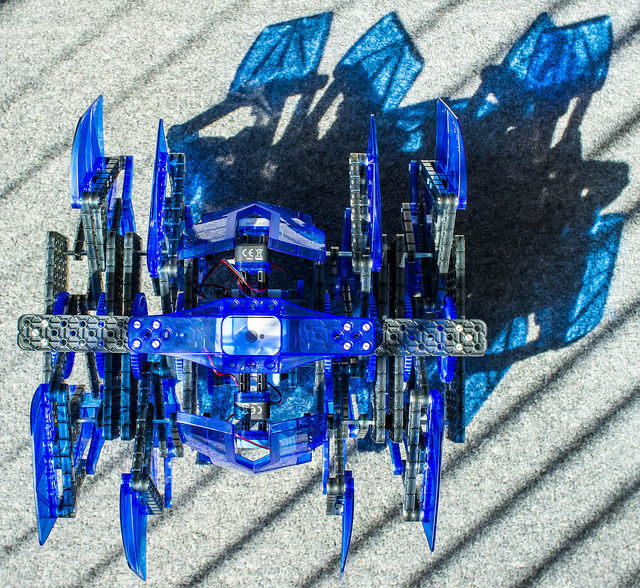 The robot is big version of the Hexbug tiny ones. It is remote controlled and is able to act intelligently. Sort of. A bit like me. It's supposed to be suitable for 8 years and upwards, but I reckon you'd really need to be a few years than older than that or have a grown up assistant. There were a few stages where I could have used some help myself. Some of the parts are very similar to each other and their alignment is very important, something you only find out when you've built it and it doesn't work properly. Also the instructions can be hard to decipher, my advice would be use the ones you can find on the web site and zoom in on them a lot. Reviews online are mixed, and I can see where the bad ones are coming from, but the robot is certainly impressive once it gets going. It has a definite preference for tiled floors, carpets cause it to get a bit stuck because its feet dig into the pile and make turning difficult. However, for the price I paid I reckon it is good value and building it was not a bad way to spend a rainy Saturday afternoon.